We use only the most efficient native plants to help you create fire just as your Hunter-Gatherer Ancestors used to! All of our kits come pre-tested and ready to use. Used by a wide variety of Native Cultures, including most in the Southwestern U.S.. Simple in its design, yet highly effective, the Hand-drill is a must for your Stone-age & Wilderness Survival Skills repertoire! This is the lightest weight fireby- friction kit that we offer. Comes with full instructions. 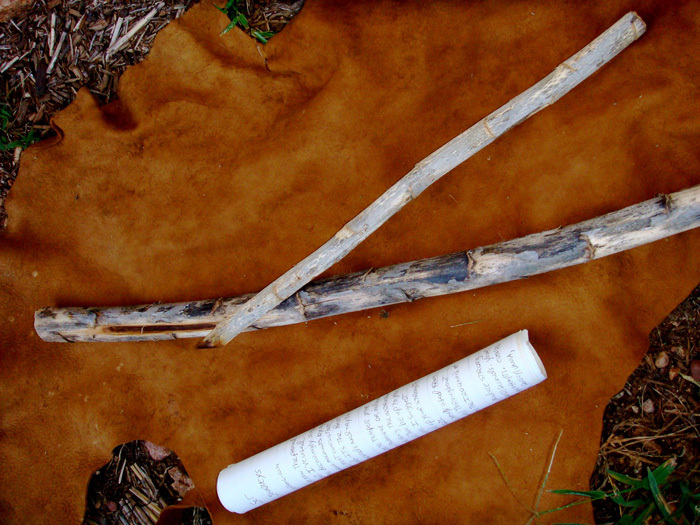 Traditionally used throughout Polynesia, the Fire-plow can often be a very difficult challenge for creating fire. 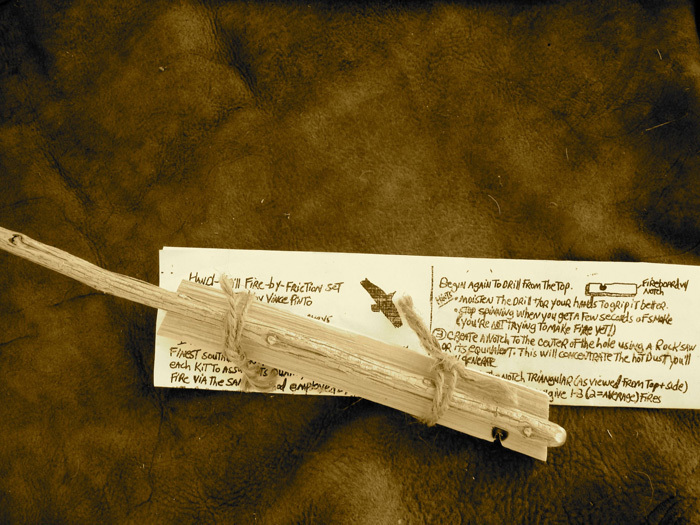 With our RAVENS-WAY sets, however, you may soon find yourself crafting fire from one of the most primitive ways ever invented by humans. Vince’s record time for making an ember from a Fire-plow kit is 6 seconds! Comes with detailed instructions. 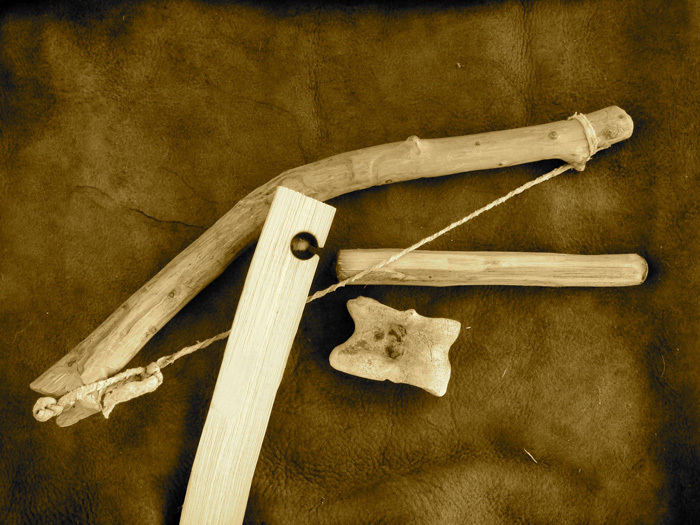 If you would like a mechanical advantage for making Stone-age fire, then this is your best bet. Employing a curved bow & cord that together spin a short drill, the Bow-drill can quickly twirl up an ember for creating fire. Traditionally employed by some Arctic and Sub-Arctic Cultures, as well as by ancient Egyptians, this intriguing firemaking device travels well in your backpack. Comes with detailed instructions. 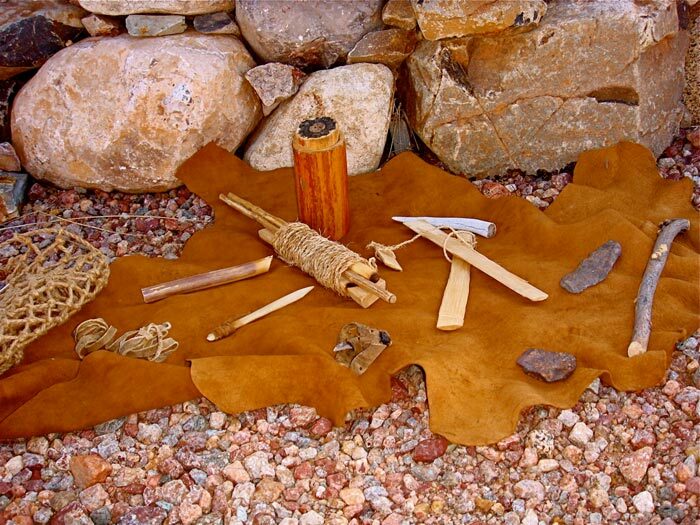 Have you ever wondered about how various Native Cultures created colorful and beautiful designs on cave walls, pottery, wooden implements, and their own bodies. Now you can learn their secrets! We have assembled a wonderful and ready-to-use kit that will soon have you embellishing your Natural crafts. Each set comes in a natural Jute knotted-net bag and contains 5 mineral paint stones, one powdered paint in a natural container, 4 double-ended plant paint brushes, a buckskin wiping pad, and full instructions. 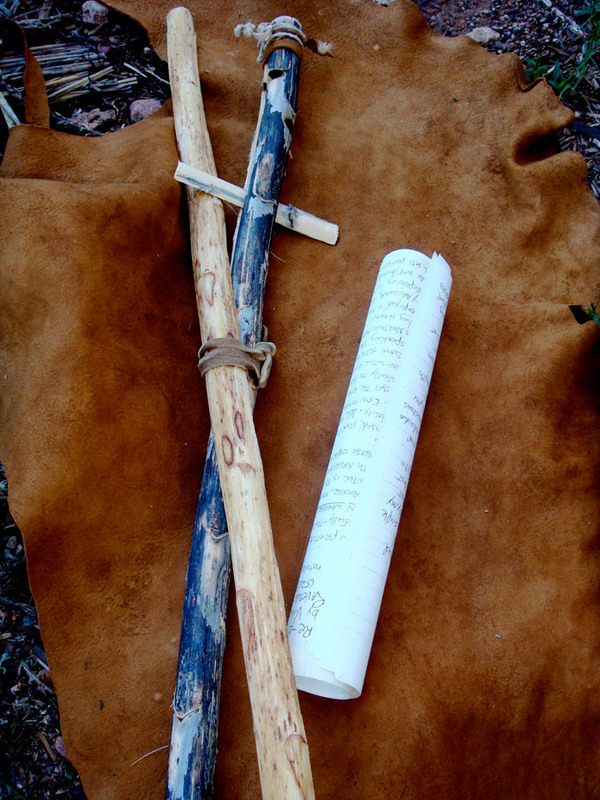 Much emphasis is often placed upon the concept of a wilderness survival kit, and rightly so, as preparedness prevents many mishaps. But, how can you wean yourself from all of the modern gadgets and gear (few of them replicable) found in most kits? 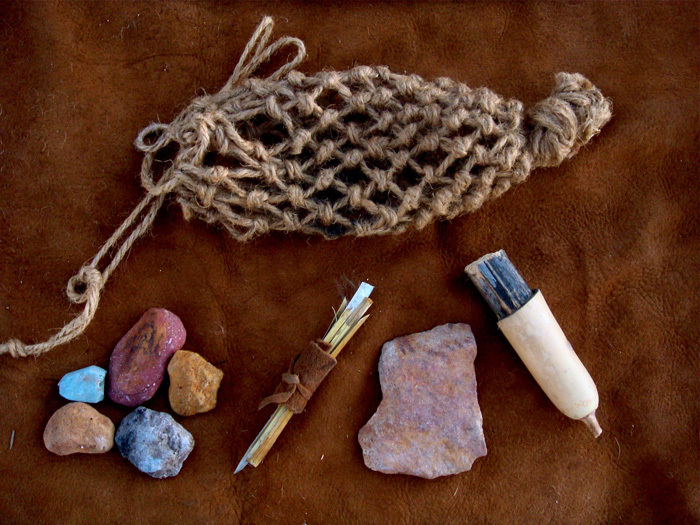 Here is your answer – our lightweight, all natural, and effective Stone-age Survival Kit! Packed with many useful and potentially life-saving items, all in a handy carrying bag, our Survival Kit can potentially help you in a difficult situation in Nature. Since it is lightweight, you can carry it with you virtually anywhere to have it handy. For thousands of years the San people of southern Africa, including the Kalahari Desert, used Ostrich egg shells as water containers. 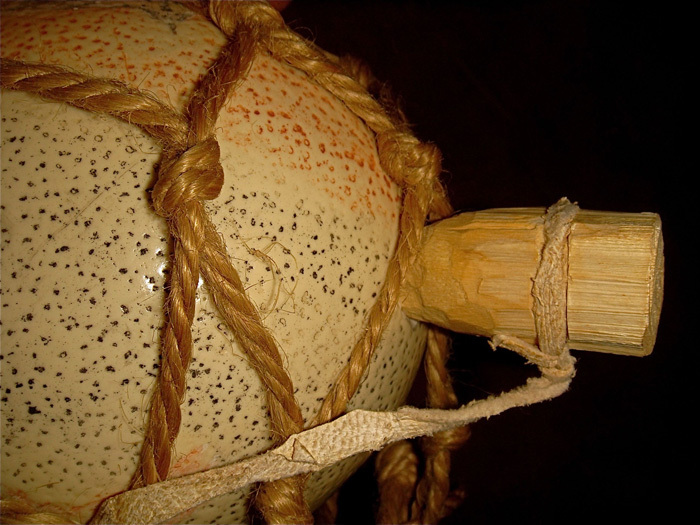 They have traditionally both carried and stored water in these amazing vessels. Once you’ve seen, touched, and listened to an Ostrich egg, you begin to appreciate its unique qualifications as a water canteen and water storage container. Using the best of the local native plants we have crafted a cork from a lightweight, yet sturdy arid-lands wood. 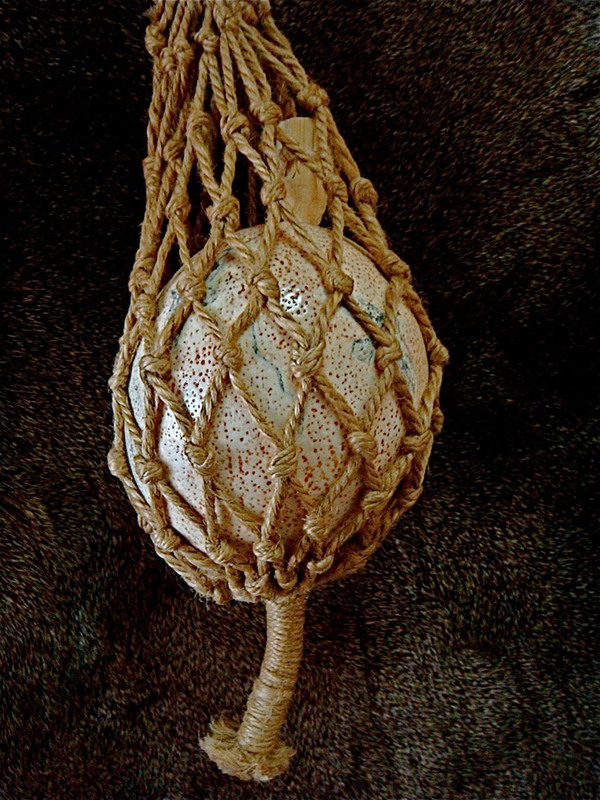 For the knotted net bag we can make it either out of Jute (as in the photo) or at your request, we can make an all-wild knotted net bag out of Palmer Agave cordage. We will also adorn your Ostrich egg canteen by applying natural mineral paints from the Earth to its surface and scrimshaw to the exterior of the egg. Alternatively, we can sell you a Mineral Paint kit for you to adorn your Ostrich egg water container if you prefer.